Winter wedding photos can be dramatic and beautiful. A couple stands by the ocean in the fading daylight. On the sand by the water’s edge, they are illuminated on the beach by a single shaft of light against the blue waves. 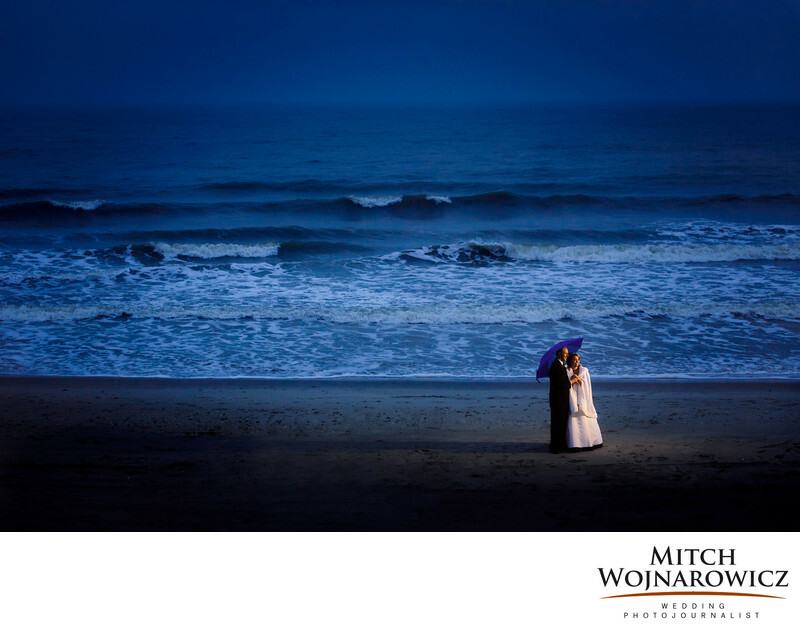 When you think of beach wedding photos, you automatically think of warm summer months. But depending on the climate, there can be beach weddings in many months of the year. This isn’t precisely what you would think of when you think about a winter wedding. But this photo illustrates the point that you have to think outside the norms for having a wedding. And outside the norms of what time of year you should have a wedding. If you are considering a winter wedding, sure there can be challenges. But the reward can be beautiful and out of the ordinary photos. People will have winter weddings for many reasons. Sometimes with work schedules a winter wedding just fits best. Sometimes the couple wants to mark a special anniversary by having their wedding on that date. And lets be honest, sometimes a winter wedding can be much more budget friendly! With a skilled Albany wedding photographer, your wedding photos can be about more than a checklist. They can revolve around what the setting and the scene look like, both outdoors and indoors. Snow presents a great opportunity, where we don’t know exactly what the scene will look like, but we do know that it won’t be all green leaves! On a rainy wedding day, plans get changed. Portions of the day get cut or moved. Some things will things get cancelled. But with a winter wedding most of the events will likely be indoors anyway. So your plans for those parts of the day will be safe. If it snows on your wedding day, that’s a bonus! It means we have the opportunity for dramatic outdoor photos!